I'm going to be trying to revitalize the forum attached to this site with a few different ideas. First off, the SAM Site Overview and Image of the Week features will have their own dedicated discussion threads. The links will be provided below, as well as in a few places on the site here. Secondly, every new article (except for the above two features and updates like this) will have a link at the bottom to a discussion thread set up for that topic on the forum. Lastly, I'll be making an effort to start populating the forum with more good stuff, and I'll be logging in there at least once a day to respond to anything in there. I admittedly let the forum slide over the past few months, so I hope this can help get it going. We get around 10,000 viewers a month here right now, so hopefully we can get some good discussions going and share some interesting information. The forum does not mean that commenting will be disabled, by the way. Still feel free to leave a comment here if you wish to contribute in that fashion. 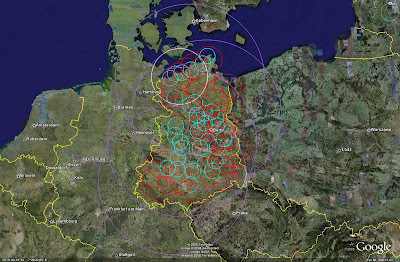 By the end of the 1980's a robust air defense network existed in the Deutschen Demokratischen Republik (DDR). DDR and Soviet air defense units combined to provide a layered air defense network capable of defending the Warsaw Pact's northwestern front. As such, the air defense assets located in the DDR provide an interesting and insightful look into Cold War era air defense. In the imagery contained within this article, SAM systems will be identified as follows: tactical SAM garrisons are marked with green circles, S-75 series sites are marked with triangles and red range rings, S-125 series sites are marked with stars and light blue range rings, S-200 series sites are marked with hexagons and purple range rings, the DDR's S-300PMU site is marked with a diamond and a white range ring, and the 64N6 (BIG BIRD) battle management radar site associated with the S-300PMU battery is marked with a square and a blue range ring. DDR air defenses were organized into two divisions. The 1st Air Defense Division (LVD) consisted of two Air Defense Brigades (FRBr) and one Air Defense Regiment (FRR), while the 3rd LVD consisted of two FRRs and one FRBr. Technical Department 310 controlled two S-75 sites and one S-125 site for training purposes. Also present were 8 tactical SAM regiments. The 1st LVD, consisting of the 31st FRR, 41st FRBr, and 51st FRBr, provided coverage of the capital area surrounding Berlin, as well as the DDR's southern flank, as seen in the image below. 31st FRR sites are colored orange, 41st FRBr sites are colored white, and 51st FRBr sites are colored purple. The 31st FRR consisted of five S-75M sites. The 41st FRBr consisted of six S-75M sites, four S-125M1A sites, and one S-200VE site. The 51st FRBr consisted of five S-75M sites and one S-200VE site. The 41st FRBr and 51st FRBr also controlled four reserve S-75 Dvina sites each. These sites, containing older, shorter-ranged S-75 systems, would be used to increase the capabilities of each regiment during wartime. The 41st FRBr covered the capital area surrounding Berlin, as seen in the following image. The four reserve S-75 sites were located along the southwestern portion of the 41st FRBr's area of responsibility. The 51st FRBr covered the DDR's southwestern flank, as seen in the following image. The four reserve S-75 sites were located in the eastern portion of the 51st FRBr's area of responsibility, along a north-south diagonal stretching from Halle to Chemnitz. The 3rd LVD, consisting of the 13th FRR, 23rd FRR, and 43rd FRBR, provided coverage of the DDR's northern flank, as seen in the image below. 13th FRR sites are colored yellow, 23rd FRR sites are colored light blue, and 43rd FRBr sites are colored dark blue. The 13th FRR consisted of four S-75M sites. The 23rd FRR consisted of five S-75M sites. The 43rd FRBr consisted of six S-75M sites, five S-125M1A sites, one S-200VE site, and one S-300PMU site. The S-300PMU's 64N6 radar facility was also subordinate to the 43rd FRBr. As was the case with many of the Warsaw Pact member states, there was a significant Soviet presence in the DDR. This presence included a number of strategic air defense units. These air defense units defended both DDR airspace, providing coverage not present under the 1st and 3rd LVD, and Soviet military facilities, including airfields home to Soviet combat aircraft. Identified Soviet air defense assets in the DDR included two S-75M sites, 24 S-125M1 sites, and one S-200M site. 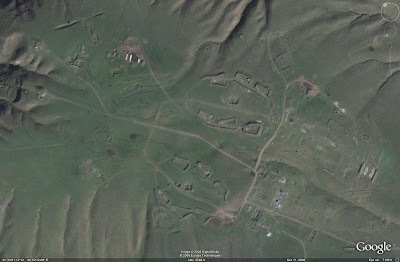 These Soviet air defense sites were concentrated in the 1st LVD's area of responsibility. Various Soviet tactical SAM units were also present in the DDR. These systems included the Krug, Osa, 9K37 Buk (SA-11 GADFLY) and S-300V (SA-12 GLADIATOR/GIANT). As tactical SAM units would have been tasked to provide mobile air defense for Soviet Army units pushing into NATO, they are not covered here. 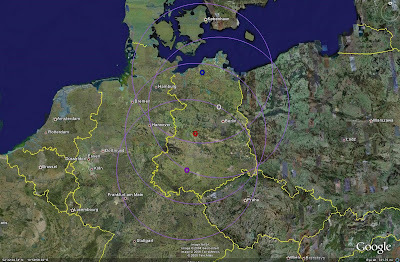 Long-range air defense of the DDR was provided by four S-200 sites. As previously mentioned, one of these sites was a Soviet-controlled battery located east of Madgeburg. These four S-200 batteries not only provided coverage over the entire DDR, but also provided significant cross-border coverage to the north and east, potentially allowing targets to be engaged before crossing into DDR airspace. S-200 effectiveness was reduced at low altitude, but the system still posed a serious threat to medium-high altitude aircraft, in particular nonmaneuverable aircraft such as ISR platforms. After an outbreak of hostilities, the S-200 batteries would be well suited to deny NATO reconnaissance aircraft from operating in close proximity to the DDR border. The deployment strategies employed by the DDR and Soviet units indicate a desire to defend both key border areas as well as major residential and industrial areas. During a postulated Soviet conflict with NATO, Soviet and Warsaw Pact units advancing into Western Europe would likely have contained organic tactical air defense units. The volume of strategic air defense units present in the DDR would suggest that the Soviets placed a great deal of importance on defending the major logistical support areas and lines of communication in the DDR. This meshes well with the Soviet concept of rapid advance of armored units into enemy territory. In order for these advances to be successful, the logistics support train must be well defended. One of the primary limitations of the DDR was the lack of suitable modern air defense systems during the latter stages of the Cold War. The main drawback of the most numerous strategic SAM systems in service with the DDR was the inability of each battery to prosecute multiple targets. The only system capable of a multiple target engagement capability was the S-200, and this could only be achieved by deploying multiple 5N62 (SQUARE PAIR) engagement radars at each location. The S-200 would typically employ one 5N62 for each 6 launcher cluster present at the site. That being said, this lack of serious multiple target engagement capability, coupled with Western advances in ECM and SEAD/DEAD tactics and weapons, threatened to make the DDR's air defense network virtually obsolete. There is a tactical SAM garrison in the area opened by the postulated strike, but this was an Osa garrison. Operation DESERT STORM proved that the Osa was ineffective at dealing with fast jets backed by EW, SEAD and DEAD assets, recording no successes against Coalition aircraft. Ergo, the strike package would likely not be threatened by the Osa TELARs in the area, being able to proceed deeper into the DDR. A turn to the south reveals another narrow corridor leading to the 1st LVD's area of responsibility being vulnerable were a second Soviet S-125 battery to be destroyed. Clearly, newer air defense systems were necessary to deal with the increased threat posed by NATO strike aircraft and their support assets. The answer came in 1989 when the first S-300PMU battery entered operational service. 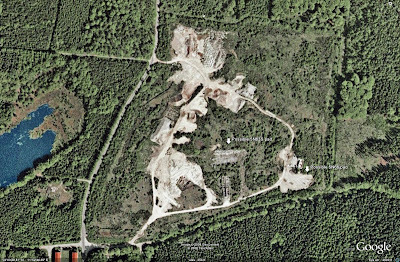 Site preparation had begun in 1984 near Retschow in the 43rd FRBr, and system operators were trained in the USSR between August and December of 1988. Superimposing the S-300PMU's range ring over the corridor generated by the postulated strike package, it can be seen that the system was capable of defending the vulnerable area in the northwest. Had the Cold War continued, modernization of DDR air defenses would have necessitated priority status within the USSR and the Warsaw Pact. Aging systems, proving to be more and more unreliable against modern combat aircraft, would likely have been supplemented and replaced by further S-300P series SAM systems in both the DDR and Soviet inventories. Only then would the air defense network of the DDR have been able to be relied upon to forestall any significant action by NATO. The range rings, site icons, detail tags, and East German border can be downloaded as a Google Earth placemark file here. Missile system engagement ranges are arbitrary figures. They represent the maximum range that a given SAM system can engage a target. They are not, however, fully representative of the missile's overall engagement envelope. There are two factors which will limit a SAM system's engagement range: terrain and the radar horizon. Both of these limitations can limit the SAM system's engagement range at a given altitude. While terrain constraints can be limited by deployment strategies and by using mast-mounted or elevated radar systems, the radar horizon is always present. The radar horizon is the maximum distance from an emitter emplaced at a given height at which it can view a target at a given altitude. This is a significant factor to understand when analyzing a SAM system as the radar horizon will determine which targets are detected and engaged at a given range. In other terms, the radar horizon is the point along the Earth's surface downrange from the SAM radar beyond which the radar may no longer continue to view a target at a given altitude. It should be noted that radar horizon and visual horizon are not identical. Due to the ability of radar waves to travel along the Earth's surface for a short distance beyond the visual horizon, the radar horizon figure will be greater than that of the visual horizon. When the radar horizon values for a given radar are combined with the maximum and minimum engagement ranges and altitude figures for an associated SAM system, the true engagement envelope of that SAM system becomes clear. To illustrate this point, consider the S-300PM (SA-20B GARGOYLE) SAM system equipped with the 48N6D missile. Postulating that the engagement radar is mounted at sea level, the radar horizon for 10 meters altitude, the minimum altitude at which the system can engage a target, is set at approximately 13 kilometers downrange from the radar set. 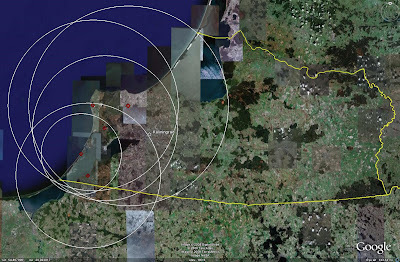 Extrapolating this data indicates that a target must be at an altitude of no less than 2,352 meters (7717 feet) to be detected and engaged at the system's maximum range of 200 kilometers. When placed atop the 23.8 meter 40V6 mast assembly, the radar horizon at the minimum engagement altitude is set at approximately 33 kilometers, increasing to 39 kilometers if the taller 38.8 meter 40V6M mast assembly is employed. When the 40V6 or 40V6M are employed, the radar minimum engagement altitudes at maximum engagement range decrease to 1903 and 1787 meters (6243 and 5863 feet), respectively. The graphics provided above are based on the data for the system when placed at sea level. Any measures taken to increase the height of the emitter, either by placing the engagement radar on a mast assembly or by siting it at higher altitude, will increase the radar horizon value for the minumum engagement altitude. To illustrate this point, consider the example of the Kaliningrad Oblast's five S-300PS batteries. Understanging the affect of the radar horizon on a given SAM system is an integral part of comprehending the true effectiveness of that SAM system. Such understanding allows the analyst to determine blind zones in the engagement envelope where low altitude platforms may operate without fear of being engaged. 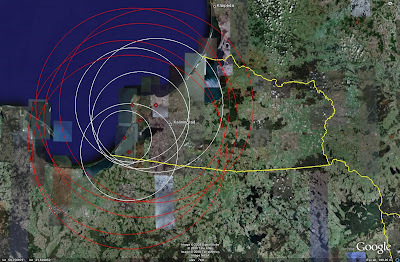 Proper exploitation of these blind zones could impart a significant tactical advantage during an aerial campaign, highlighting the importance of a complete understanding of a SAM system's engagement capabilities across its entire range spectrum. The Kaliningrad Oblast has historically been a significant strategic location for Russia. Home to the Baltic Sea Fleet and a number of other military units, the Kaliningrad Oblast provides Russia with a foothold in territory surrounded by NATO members. In light of recent worldwide events, the Kaliningrad Oblast may be undergoing a resurgence in terms of strategic importance to Russia. As such, the strategic air defense network of the Kaliningrad Oblast is a critical aspect of the region. 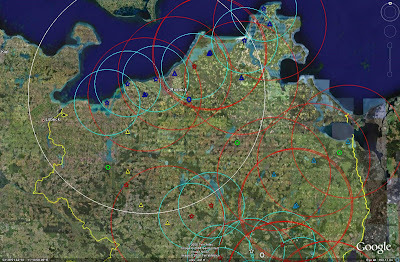 Currently deployed strategic air defense assets provide the Kaliningrad Oblast with a robust, modern air defense network. System deployment indicates that priority is clearly given to defending the western half of the Oblast, home to the majority of the significant military facilities and the Baltic Sea Fleet. 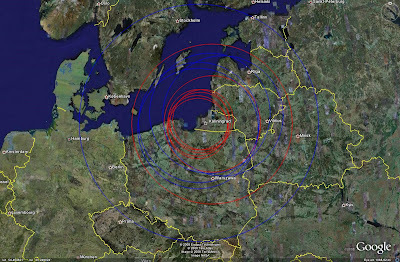 Early warning coverage of the Kaliningrad Oblast is provided by six radar facilities. One of these facilities is home to a 300 km range 5N64S (BIG BIRD B) battle management radar controlling the Oblast's S-300PS (SA-10B GRUMBLE) batteries. Four 36D6 (TIN SHIELD) radar sites with detection ranges of 165 km are also present providing additional coverage, and a further EW site features legacy radar assets providing additional support to the network. 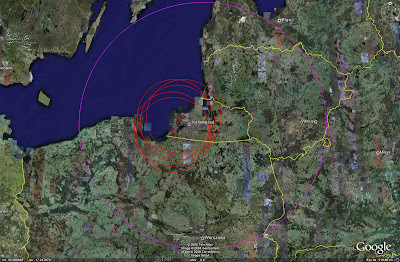 The following image depicts the locations of the Kaliningrad Oblast's EW sites. 36D6 sites are denoted by triangles, the 5N64S site is denoted by a hexagon, and the legacy EW site is denoted by a square. 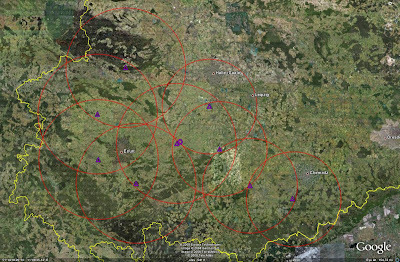 The coverage of the 5N64S radar site provides the network with the ability to monitor the airspace over the entire Oblast, with coverage extending into Belarus, Latvia, Lithuania, and Poland. A significant portion of the Baltic Sea is also covered, extending to the shoreline of Sweden. The 36D6 sites, one of which being co-located with an S-300PS battery, are also situated to provide coverage of the entire Oblast as well as portions of Latvia, Lithuania, and Poland. The 36D6 radars are also capable of monitoring an off-shore swath of airspace, albeit to a lesser degree than the longer-ranged 5N64S. The off-shore reach of the Kaliningrad Oblast's EW radars allows them to operate with SAM batteries to provide air defense for Baltic Sea naval vessels operating in the area. The positioning of the various radar sites provides the network with a significant degree of overlapping EW coverage. The 36D6 radars can also provide targeting support to the S-300PS batteries should the 5N64S radar be rendered inoperable. 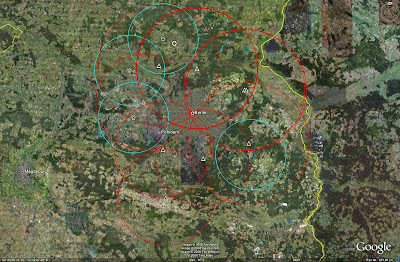 While this would result in a loss of range with respect to target acquisition, the 36D6 sites are positioned in a manner that ensures that the engagement zones of the S-300PS batteries are not affected. The relatively low, flat terrain in the surrounding areas also ensures that a reliance on the less sophisticated 36D6 radar sets, which can be mounted on 40V6 mast assemblies for increased low-altitude detection capability in areas of rough terrain, would not result in a significant degradation of target acquisition functions. 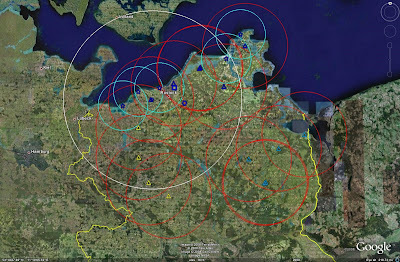 Strategic air defense of the Kaliningrad Oblast is provided by six SAM sites. 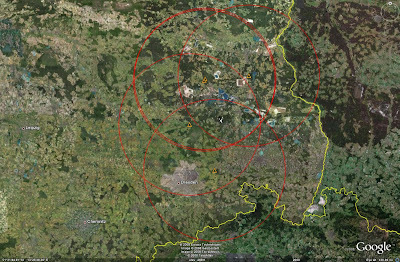 Five of these sites are occupied by mobile S-300PS SAM systems with maximum engagement ranges of 90 km. The sixth site is the sole remaining S-200 (SA-5 GAMMON) SAM site still actively serving with the Russian air defense network. 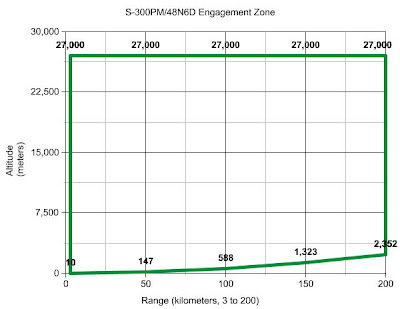 The S-200 has a maximum engagement range of 300 km. 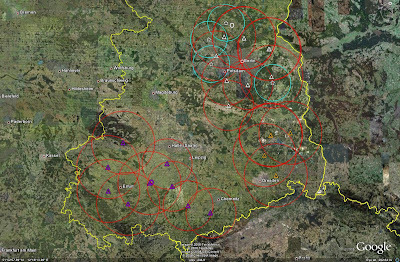 The following image depicts the operational SAM sites in the Kaliningrad Oblast. S-300PS sites are denoted by red diamonds, with the S-200 site being denoted by a purple diamond. The S-300PS sites are all situated within 11 kilometers of the shoreline in the westernmost portion of the Oblast. 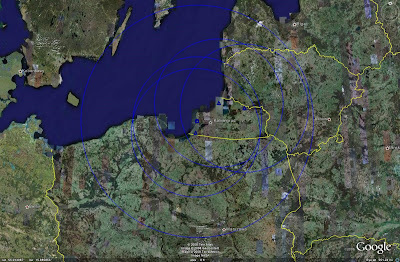 Their proximity provides a layered air defense capability over the city of Kaliningrad and the Baltic Sea home port. The multiple target engagement capability, 6 targets per battery, and effectiveness of the system against low RCS targets represents a significant threat to any potential airborne aggressor. The deployment of S-300PS batteries in lieu of more modern S-300PM (SA-20 GARGOYLE) batteries appears at first glance to be intended to protect the more advanced variants from being exploited by ELINT collection platforms in the area, potentially enabling vulnerabilities to be discovered that would put areas protected by S-300PM batteries at increased risk during times of war. However, following the delivery of the S-300PMU-1 to NATO member Greece and deployment of S-300PMU-1 batteries along the Chinese coastline, exposing them to EP-3 ELINT aircraft, it is more likely that the S-300PS was retained for air defense of Kaliningrad because deployment of the longer-ranged S-300PM was not deemed necessary to ensure adequate air defense coverage. The S-200 battery is centrally located within the Oblast, but the system's 300 kilometer maximum range allows it to range targets inside of Poland, Latvia, and Lithuania. The system also offers a significant off-shore capability. While the S-200 is no longer a reliable system for engaging maneuverable targets such as fighter aircraft, it remains a significant threat to ISR platforms. The significant reach of the system both offshore and into the surrounding NATO member states would provide Russian air defense commanders with the ability to threaten ISR platforms operating in close proximity to Kaliningrad but remaining outside the engagement zones of the S-300PS batteries. Imagery of the S-200 site, seen below, suggests that two of the three batteries remain active, allowing the system to potentially engage two targets simultaneously. There are currently nine inactive strategic SAM sites that have been identified within the Kaliningrad Oblast. These sites are prepared S-75 (SA-2 GUIDELINE), S-125 (SA-3 GOA), and S-300P sites. 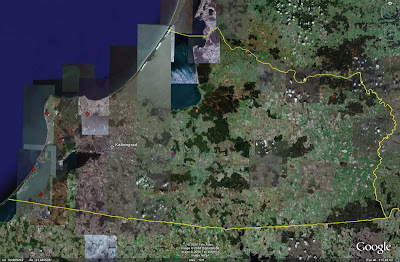 One tactical 2K12 (SA-4 GANEF) deployment site has also been located and is included here although tactical SAM coverage is outside the scope of this article. During hostilities, these inactive sites could be exploited to provide dispersal sites for the Oblast's resident S-300PS batteries. While only two of the sites are operationally configured for the S-300P, all of the sites would at least provide a degree of protection for the components thanks to the presence of different revetment configurations. Alternatively, S-300P series batteries could be deployed to the area to take up residence at some or all of the sites to bolster the air defense capability of the Oblast. It should be noted that the 5N83 battle management complex employed by the S-300PS, which includes the 5N64S battle management radar, is capable of supporting six S-300PS batteries. Were there to be multiple S-300P series batteries introduced into the region, one or more additional 5N83 complexes would be needed to be deployed as well. The following image depicts the overall coverage areas of both the SAM and EW assets in the Kaliningrad Oblast. This image highlights the overlapping layout of the entire network, depicting how the EW and SAM sites are positioned to support and defend each other. 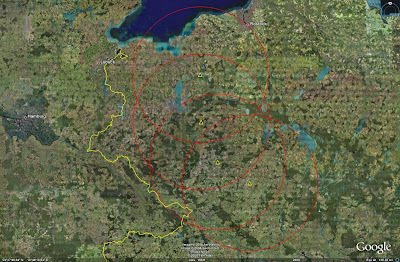 The multiple target engagement capability of the S-300PS, combined with the expansive EW coverage, allows the Kaliningrad Oblast air defense network to effectively repulse a small-scale strike package, perhaps designed to target and eliminate nuclear missiles in the area. The S-300PS network could engage a total of 30 targets simultaneously, and would be backed up by an Su-27 (FLANKER-B) interceptor unit in the area. Anything less than a full-scale aerial invasion of the Oblast would be an extremely difficult operation to successfully accomplish without risking severe losses and potential failure, inviting a Russian response which could conceivably escalate into an environment where a nuclear exchange is a definite possibility. Modernization efforts for the Kaliningrad Oblast's air defense network have been discussed in the open press as far back as 2001. Russian officials have stated that the extant S-200 complex will remain operational until it is replaced by the new S-400 (SA-21). 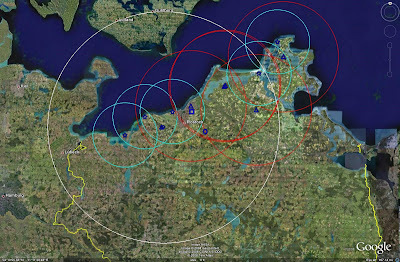 S-400 batteries are currently being assigned to the Moscow air defense network, and it could be assumed that it will be some time before a battery is available for assignment to the Kaliningrad Oblast given Moscow's higher strategic priority. However, given the deteriorating relationship between Russia and NATO, replacing the S-200 complex with the S-400 may take on an increased priority in the near term. It is also possible that 150 km range S-300PM batteries displaced by S-400 units around Moscow could be reassigned to the Oblast to replace the older S-300PS batteries. Were the SAM units to be upgraded, upgrading the EW network would also be necessary, particularly to support the S-400. The 5N64S battle management radar and associated 5N83 battle management complex would need to be replaced by the newer 30K6 complex and 600 km range 91N6 (BIG BIRD E) radar. A one-for-one replacement of S-300PS batteries by S-300PM batteries would necessitate the presence of a single 30K6 complex, capable of handling up to six S-300P and/or S-400 series batteries. Replacement of the 36D6 radar systems with newer 300 km range 96L6 radar systems is also a possibility as these systems were designed to operate with S-300PM and S-400 batteries. 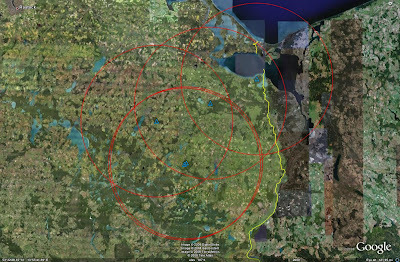 Postulating the replacement of 36D6, 5N64S, S-300PS, and S-200 units with 96L6, 91N6, S-300PM, and S-400 units respectively, the following image depicts the potential coverage of the future Kaliningrad Oblast air defense network. Two range rings are provided for the S-400, one depicting the 240 km engagement range of the 48N6DM missile currently deployed with the system and one depicting the 400 km engagement range of the future 40N6 missile. 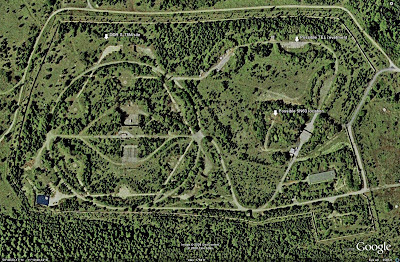 As can clearly be seen, such a modernization of the air defense network would significantly enhance the coverage area. 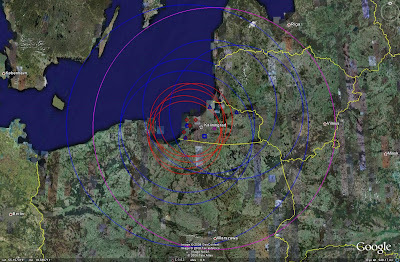 The detection range of the EW assets would enable targets to be detected over the entirety of Poland and the Baltic Sea. 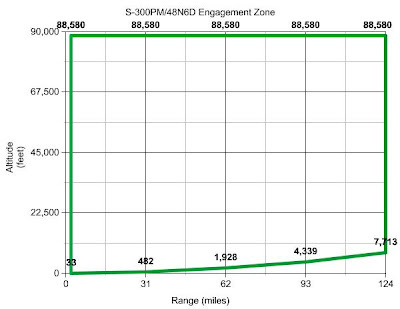 Increased engagement ranges allow the western-sited S-300PM sites to combine with the S-400 battery to provide overlapping fields of fire over the entirety of the Oblast, bringing the eastern portion of the territory under the protection of a modern SAM system allowing for potential surface-to-surface missile units to be dispersed over a greater expanse and still remain under the protective umbrella of the network. This capability would potentially allow SSM units to deploy without organic tactical air defense support, aiding in their concealment during wartime as there would not be nearby SAM units giving off tell-tale radar emissions. Increasing the difficulty of locating and targeting any such missile units would increase their effectiveness as a potential nuclear deterrent. As relations between Russia and the NATO powers have progressively deteriorated for a number of factors, to include Western political opinion regarding Russian military action in the Caucasus, insinuations have been made that Russia may place nuclear-armed missiles inside the Kaliningrad Oblast as a counter to American missile defense deployments in Poland and the Czech Republic. Regardless of whether or not this comes to pass, air defense of the Kaliningrad Oblast will continue to be a strategic priority for Russia, helping to ensure the continued security of its foothold inside territory dominated by NATO members. 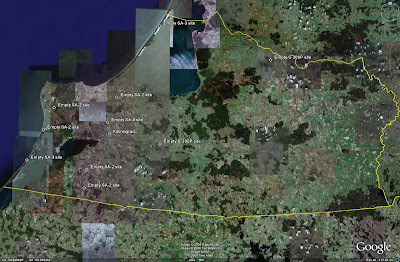 The range rings and site locations used in the imagery in this article can be downloaded as a Google Earth placemark file here. Between 8 and 11 August the Georgian-Russian dispute over the separatist provinces of South Ossetia and Abkhazia came to a violent head. Regardless of who is more at fault, the separatists, Saakashvili's Georgian government, or the Medvedev/Putin government in Russia, the entire affair has been surrounded by massive amounts of disinformation thanks in no small part to an apparent total disregard for accurate reporting by the media. There is an absurd amount of inaccurate information being propagated throughout the media regarding the current conflict between Russia and Georgia. Supposedly professional and well-respected media outlets have been severely lacking with respect to fact checking and corroborating the news they have been reporting. The Associated Press, among other sources, has been spreading the story that Russian warplanes were dropping bombs in close proximity to the Baku-Tbilisi-Ceyhan pipeline, which is the second longest oil pipeline in the world. Various media sources have claimed that there were attacks which in some cases resulted in bombs impacting within close proximity to the pipeline itself. The alleged pipeline attack was mentioned, for instance, in an 11 August Associated Press report. The date of the report itself tells any intelligent reader all they need to know about the fact-checking abilities of the Associated Press; on 9 August, Agence-France Presse reported that British Petroleum, one of the shareholders of the pipeline, was not aware of any such attack. An 11 August interview with BP officials published in The Telegraph indicated that BP workers had in fact inspected the pipeline and found absolutely no evidence of any bombing raids whatsoever. One would think that if the Russian air force had been attempting to bomb the pipeline, that evidence of impact craters would have been found. There was also an ironic incident where Russian Su-25s (FROGFOOT) bombed a factory near the Tbilisi airport, a factory which had at one time produced Su-25s! This was translated into a Russian attack on the airport itself, a claim which was even denied by the Georgian government. In another example of erroneous reporting, New York Post columnist Ralph Peters stated that Russia was employing precision guided munitions (PGMs), in part of a 12 August column seemingly written with the sole intent to disparage the performance of Russian military units. Russian General Staff Deputy Chief General-Colonel Anatoly Nogovitsyn seemed to provide evidence to back up Peters' claim in an August 12 Kommersant report. General-Colonel Nogovitsyn claimed that Russia possessed "weapons allowing to hit only the facilities threatening our troops instead of fighting by carpet bombing", claiming that this is what the Russian military was doing. Here's the issue: Nogovitsyn did not necessarily specify that these were air-delivered weapons. Russia has employed the 9K79 Tochka (SS-21 SCARAB) SRBM against Georgian positions, and while the Tochka is not necessarily a PGM in the truest sense of the word, the 90 meter CEP does provide far more accuracy than other Russian SRBMs and battlefield support systems. Furthermore, there have been various images spread around the internet showing Russian Su-24 (FENCER) tactical bombers uploaded with weapons. Some of these images have depicted the Cyrillic script applied to the weapons by Russian aviators as messages to their intended targets. The weapons in question were all unguided gravity bombs of various sizes. If Russia was air dropping PGMs, what are these Su-24s doing toting standard dumb bombs? Various international media outlets are also carrying stories detailing Georgian claims that cluster bombs were employed by the Russians; cluster bombs are indiscriminate, inaccurate weapons designed to saturate a portion of the battlefield. Again, where are the PGMs? Peters also claims that Russian pilots are flying their latest combat aircraft. This is patently false. The combat aircraft employed by Russia on bombing sorties over Georgia are Su-24s (FENCER-D) and Su-25s. Anyone with a basic knowledge of the Russian air force will be aware that both the Su-27SM and Su-34 are currently in service to varying degrees, both of which are far more capable air-to-ground platforms in most respects than their legacy Sukhoi counterparts. The Su-34 is in fact currently entering service, with five series-produced examples undergoing trials at Lipetsk. The Su-34 has been trialled in combat before over Chechnya while still in prototype form, so operational use over Georgia would certainly have been a possibility. Peters' problem is an apparent desire to paint the Russian pilots as ill trained and incapable of performing simple combat tasks. By claiming that the Russian aircraft are employing PGMs he creates an illusion that the bombs being dropped are not being employed properly as they are not striking targets with a high degree of accuracy. By claiming that Russia is employing the most advanced aircraft in its arsenal, he creates an illusion that the Russian pilots are not competent enough to handle modern warplanes. Unfortunately the evidence simply does not support any of his ludicrous and obviously biased claims against the Russian Air Force. Peters has traveled through Georgia, and may therefore have a sympathetic view of their situation, but his (admittedly op-ed) piece does nothing to reinforce his credibility as an objective journalist. One of the most propagated theories behind the Georgian conflict is that it was preplanned and prepared for in advance by the Russian military. Logically, this should of course be partly true. Any military worth its salt will always be preparing for likely future conflicts. Two American examples of warplanning are OPLAN 5027, outlining plans for a conflict on the Korean peninsula, and OPLAN 8044, dealing with nuclear warfighting. Given the recent history of the Georgian situation, it would be illogical to assume that Russia had not at least outlined plans for a military action against Georgia. Russian troops based in Georgia pre-conflict were described as peacekeepers; peacekeepers would not be necessary were it not for the potential for open conflict, and where there is potential there will most assuredly be a contingency plan. But does this mean that Russia purposely created an environment where such a contingency plan would be called into action? The interesting aspect to this theory is that it can only survive in blind ignorance of the events leading up to the conflict. Prior to the outbreak of serious hostilities, South Ossetian separatists and Georgian military forces had begun trading fire as early as 1 August in response to separatist shelling of Georgian villages in South Ossetia. By 3 August Russia was warning Georgia that the conflict would escalate if it continued further. After declaring a cease-fire on August 7, Georgian forces began to assault South Ossetia during the early hours on August 8 in response to further shelling by separatist forces. By August 11, Russian forces were entering Georgia, seemingly to end the conflict on their own terms. The idea that Russia preplanned and provoked the entire operation is clearly absurd. There were multiple meetings within the framework of the UN and multiple talks regarding a ceasefire well before August 11, and in some cases even before August 8. The South Ossetian separatists do appear to have been the primary instigators of the conflict, but this was a full 10 days before any major Russian military involvement in the area. The main evidence used to support the idea that Russia was behind the conflict as a means of invading Georgia was that the 58th Army or some other force was prepositioned near the Roki tunnel to allow them to advance into Georgia. A US defense official was quoted by AFP on 12 August as stating that there was no evidence to support a buildup of Russian forces prior to the invasion. Rather, American military officials were suprised with the rapidity with which Russian forces mobilized and deployed into the conflict zone. This should not necessarily have been much of a shock, as there were Russian troops in the area prepared to enter South Ossetia. These troops were taking part in the Kavkaz-2008 exercise in the region, and Russian Army spokesperson Igor Konashenkov claimed that they would in fact be reporting to South Ossetia in the near future as replacements for the current peacekeeping force stationed there. As a result, according to Konashenkov, part of the Kavkaz-2008 exercise would focus on that peacekeeping mission. Kavkaz-2008 ran through the end of July and it is possible that the troops had not left for their garrisons when initial signs of conflict appeared on 1 August. Russia's warning of expanded conflict on August 3 may have led to many of the troops involved with Kavkaz-2008 remaining in the area. Of course, moving troops rapidly and with little warning has been a hallmark of former Soviet doctrine for a European war. Given Russia's knowledge and infrastructure, it is also just as likely that troops were mobilized on 3 August and moved towards the battlefield with lightning speed once Moscow decided to become seriously involved. The Russian 58th Army, for example, has been cited as being involved in the conflict. The 58th Army is based at Vladikavkaz in the North Caucasus Military District, less than 50 kilometers from the Georgian border. If mobilized on or about 3 August, moving elements of the 58th Army into South Ossetia by 11 August would not be a difficult task, particularly if they had been involved with Kavkaz-2008 and were therefore already at an increased state of readiness. Returning to Ralph Peters' journalistic slaughtering of the facts surrounding the conflict, Peters claims that airstrikes were launched against pre-planned targets, citing this as an example of how Russia had clearly been planning for the conflict. This is both accurate, and absurd. Anyone remotely familiar with the concept of ISR will state that any area of potential conflict is monitored for enemy forces and scanned for potential targets. This is all part of the contingency planning process described earlier. Russia has likely searched the United States to derive aimpoints for its ballistic missile force, does this mean that Russia is also looking for an excuse to engage in a nuclear exchange with the United States? It is absurdity such as this that only serves to propagate the appearance of a decidedly anti-Russian bias throughout the West, a bias that will ultimately hinder continued relations between the US and Russia as it begins to affect the populations of both nations. Further demonstration of Peters' decidedly anti-Russian bias can be found in another New York Post column from 9 August. In this diatribe, Peters claims that the Russian 58th Army was incapable of short-notice combat operations due to readiness issues. Apparently he failed to make a journalistic inquiry to the US defense community, as they have a decidedly different opinion, and decidedly better sources. Another piece of information used by the media to paint the picture that Russia decided to provoke a conflict was the April 2008 placement of artillery pieces in Abkhazia. This can be partly explained by referencing the UN Arms Register, which details the acquisition of mobile artillery pieces by the Georgian military well prior to this date. Once again, standard military practice rears its head. In a potential conflict zone, it is ludicrous not to be prepared to fight your enemy on at a minimum the same level. In the West, however, this must only mean that the Russians are planning a war. Furthermore, the Georgian newspaper Kviris Palitra ran a story in June of 2008 detailing Georgian air defense assets. The assets mentioned included the S-125 (SA-3 GOA), Osa-AK (SA-8 GECKO), and Buk-M1 (SA-11 GADFLY). The Osa and Buk systems are known to have been sourced from the Ukraine, while the S-125s remained from Soviet times. A May 2008 article in the Kiev Kommentarii detailed numerous arms sales by the Ukraine to Georgia, and made mention of a Buk sale in 2005. A glance through the UN Arms Register shows that the Ukraine delivered Osa systems in 2006 and Buk systems in 2007 as well. No serious mention has ever been made of an S-200 sale by anyone except the Russians, and the Ukraine denies having provided such a system. Given the status of the S-200 facility in Georgia and the evidence provided by Kiev, Tbilisi, and the UN, there is no credible evidence to support the assertion that any S-200 was ever sold to Georgia. The S-200's role in Georgian air defense seems to have ended with the deactivation of the battery near Tbilisi. One final example of faulty reporting relates to the purported S-200 sale. Russia claimed that a Tu-22 was downed by the Ukrainian-supplied SAM system. This led to various media outlets reporting that a Tu-22M3 (BACKFIRE-C) was lost over Georgia. A Tu-22M-series aircraft was downed, but proper examination of the facts would suggest that it was not a Tu-22M3 but in fact a Tu-22MR (BACKFIRE-D) reconnaissance aircraft. In this case, deliberate misrepresentation or altering of the facts behind the story does not appear to have taken place (excluding the aforementioned S-200 report, of course). This would appear to be representative of the media's lack of knowledge and attention to detail rather than deliberate false reporting. The crewmembers who were flying the Tupolev were recovered and hospitalized by Georgian forces, and have been interviewed by the media. The pilot claimed that the aircraft was on a reconnaissance mission, flying from Engels air base. Engels is not a Tu-22M operator, so any BACKFIRE operating from there would have been forward deployed. Furthermore, the basic Tu-22M3 is a sub-strategic bomber, capable of carrying a variety of weapons but not possessing any credible capability to conduct reconnaissance sorties. The Tu-22MR, on the other hand, is a dedicated reconnaissance aircraft. If the pilot of the aircraft is to be believed, then he must have been flying a Tu-22MR rather than a Tu-22M3. Neither Georgia nor Russia are entirely without fault in the current conflict. Georgia escalated the conflict by attacking the South Ossetian capital of Tskhinvali following clashes with separatists. Russia took it to a wholly different level with a massive military campaign designed to deny Georgia the ability to inflict further damage to South Ossetia. However, misreporting and deliberate distortion of the facts by the worldwide media has led to a convoluted picture of the events that have taken place. The fact that so many of the most commonly reported news items can be disassembled piece by piece with a few minutes of research places doubts on the credibility and objectivity of these establishments. When dealing with Russia after the cessation of hostilities, it would be wise to remember that there is no evidence to suggest a preplanned and orchestrated campaign to allow Russia to invade South Ossetia and Georgia. Painting Russia as a resurgent Evil Empire is a sign of unsubstantiated bias and nothing more. After all, Russia did warn Georgia that escalation was possible, and Saakashvili chose to give them the excuse needed to ensure the integrity of South Ossetia, perhaps permanently. Arguing that Russia's methods were overkill is one thing, accusing them of trying to take over the Caucasus is another thing entirely. Did Russia use cluster bombs?